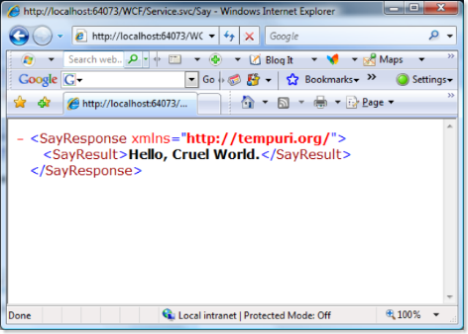 WCF Web Progamming 1. Jef 0.
read another blog post from Steve to be on the safe side, and hit f5. I can also (almost) fix it with a wildcarded UriTemplate, but we'll save that for tomorrow. As mentioned, the model is currently a little picky about trailing slashes, so /Service.svc/Say/ yields the first image above. If we revisit the service contract defined above, the only thing excluding the WebServiceHostFactory that is specific to ol' Webby is the WebGet attribute. If we look at the web get attribute, it defines a couple of public properties that allow us to shape the messaging a bit, BodyStyle and UriTemplate. We'll take a glance at BodyStyle first. WrappedRequest and WrappedResponse give you control over the individual messages. I won't demonstrate those further. I'll look a little more closely at UriTemplate tomorrow. Following that, I want to pllay around with basic HTTP types of things like cache awareness, content negotiation, json, status codes, headers, chunked encoding, streaming, async models, etc. Once we get all of that squared away, I'll start using the API to do "real" stuff. Then I'll dig into the syndication support, etc. Quick review: Currently, I think that IHttpHandler has a slight leg up on WCF in terms of simplicity and adhering to the principle of least astonishment. 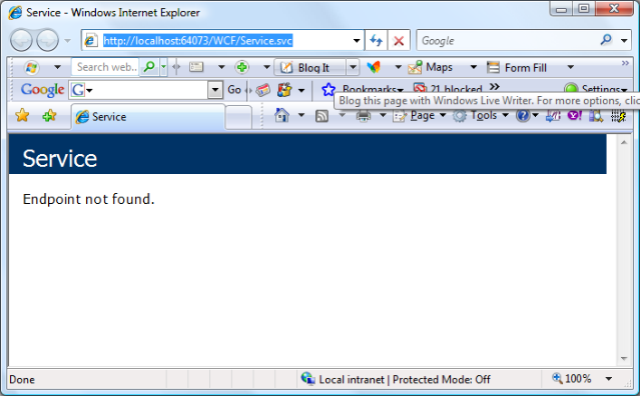 One thing I do get from the WCF web programming model is serialization to and from .NET types. That is pretty cheap with DataContractSerializer, XmlSerializer, and friends. Another thing that I get is a more simplistic method of mapping HTTP methods to .NET methods, so I can avoid having a Servlet-like interface and I can avoid writing a switch statement. 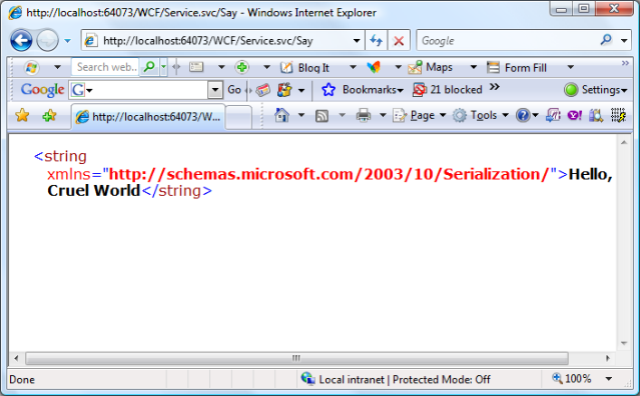 The Microsoft namespace for serialization is interesting, but I would want to avoid that. It's a bit too leaky an abstraction for me, though I suppose I grok why it's there. We haven't done anything terribly interesting yet, so I am still feeling very positive about the WCF web programming model. There's some good stuff under the hood. UriTemplates, for example. Looking forward to it. Here's a little bit of fiction for you, with a prefaced disclaimer. I'm not anywhere near claiming that these thoughts are moderately well-formed. "Hey, this web stuff is cute. OK, back to the real stuff. [CORBA, DCOM], anyone?" "Hey, what the !*@&#^#? I can't connect my [CORBA, DCOM] over the net. Hmmm...."
"Hey! If I could just go through port 80, I could connect my [CORBA, DCOM] bits over the internet. Cool!" "HEY!?!?! Why is this firewall looking at my content? Argh." "Hey! What if, instead of IIOP, I encoded this stuff as XML? It'll be slow, but .... COOL!" "Hey, what would be great is if I had a generalized envelope so that I could add in a bunch of orthogonal features like transactions and security and reliability! But what to call it? ... How about, um, SOAP? Cool!" "Hey. What would be great is if I had a nice, generalized OM for distributed programming that sits on top of all of this infrastructure so that I can almost transparently switch between programming models and stuff. That's be cool! I'd rule the world! What do I call it? Hmmm.... how about, um, 'Indigo?' Cool!" "Hey -- how the $&%^% to we do HTTP GET?" D'oh. I find this interesting. So, basically, at the end of the day, there is a baseline understanding of how the web was designed and currently works that was largely ignored/dismissed in the soap world and specifically in the Connected Systems Division until this Biztalk SDK. Many of us, myself included, drank to kool-aid on soap early on, because we wanted to connect systems together, and we liked messaging or we liked distributed objects, and we didn't stop long enough to grok fully the web. As I did more web stuff, I realized that I didn't really care about a lot of the stuff that was layered into the SOAP/WS stack, and I did really need and love the beauty of GET and friends. Do we need SOAP? Sometimes. Maybe. It is nice for layering in security when transport security isn't good enough. Do we need contracts? Sometimes. Maybe. It can help make the services and resources more accessible to the broad mass of developers. But in many cases, the service provider ships SDKs as well, and that makes the contract less necessary at the expense of coupling. Also, you often get a set of examples of documents, and you just 'hack something up.' Often, the contracts that are already out there (HTTP, RSS/ATOM, etc.) are good enough. So, it is interesting to me to watch guys like Clemens Vasters and Don Box (and Steve Maine, though I think he was less heavily involved in 'expectorating' the WS-splat and a lot more heavily involved in consuming and evangelizing prior to getting into the big house) starting to shed the WS-Splat baggage and just GET it. And I think that they are being pragmatic about it and trying to scratch the 80% itch (GET) really well, but they are adding in a decent set of support for the REST (ha, pun, ha ha, er, um...) of the story without being to religious about being RESTful. And when questions come up like [paraphrased] "Well, shouldn't you layer soap into that?" they look very relaxed and calm as they say [paraphrased] "Nah, you're not going to need it here." From the outside, it looks a little cathartic. The real challenge to applying REST as a means to implement loosely-coupled Services is that REST has no explicit contract to define behavior, which means that all behaviors are implied. In REST, the data pumped through a GET, PUT, or POST operation contain all the semantics necessary to understand how a Service behaves. Therefore, REST isn’t appropriate for organizations that wish to take a contract-first development approach aimed at maximizing reuse and composition, in addition to loose coupling. And that’s the rub with REST – SOA aims to reuse not just the resource, but also the operation and the composition as well. [Emphasis mine.] Hmmm. I was thinking that the contract is explicit (for purists or pragmatists). Of course, I don't work for a research firm, so there you go. "Data pumped." He makes it sound as if the data is encoded with the application semantics and is merely being "tunneled" over HTTP rather than the application is using HTTP to broker the application state. Oh wait, but isn't that SOAP? File under 'M' for misunderstanding. Ron, here's a suggestion for some research. Pick a problem worthy of a services and/or restful solution. Solve it twice, once with REST and once with WS-splat. Hire some high-priced consultants to help you get each "right," if necessary. Publish the results. Boy, now that would be nice. Clemen's projects are always so cool. Do you take Visa? It is interesting that he is going POX/REST-ish, especially given a previous missive, but it is the perfect choice. I found this crafty Ajax.NET library that adds AJAX support to ASP.Net apps via simple attribution. 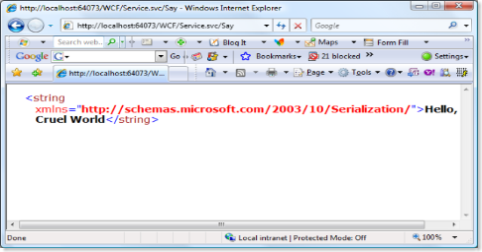 The package comes with a single DLL that you reference from your WebApp, as well as a complete usage guide. The author, Michael Schwarz, has a blog and is even lobbying to get AJAX support added to Whidbey, which would be very cool, but not likely at this date. The implications of Ajax are wide reaching. Most obviously, groovy applications like Google Maps can be made. But many of the standard web controls we're used to could also be made more interactive with the server without requiring traditional page postbacks. And, where one might struggle with whether or not to query a large result set from a web page due to potentially slow information retrieval, Ajax brings the possibility of paging through data and retrieving each chunk via an XML request instead of a postback and page refresh. What's the difference with regression testing? 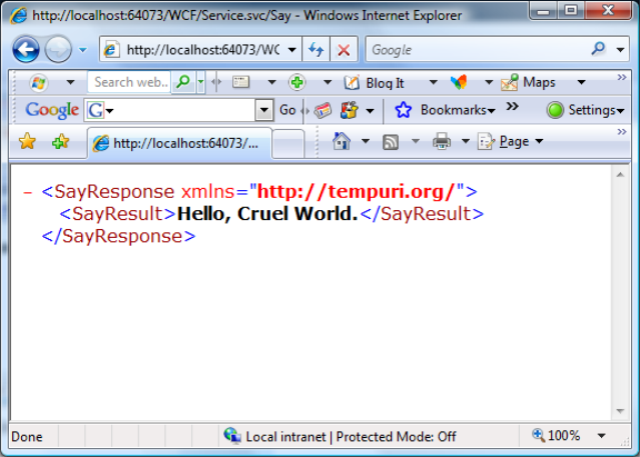 I originally planned to parse XML elements and spit out some specific error statements about the differences. But, my client suggested just comparing the files with a visual diff, thus tossing the data in question up in front of the user with all the context required to determine the real error. Way to leverage the readability of XML! Feel free to use this technique anytime – no charge. Oh, and make sure the XML is generated with <new lines> or your diff will just show one long line in error. 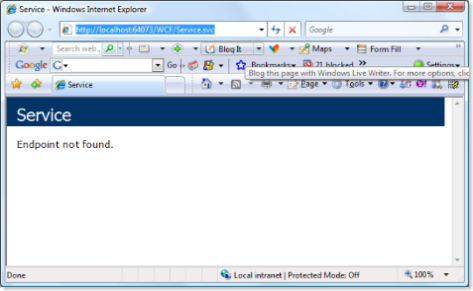 I cannot tell you how many times I have been using typepad to enter a blog entry, and have accidentally hit a link in some other random application that took over the existing instance of IE and caused me to lose my post because I hadn't saved it as a draft. This is one of those posts. I had a nice explanation of where I was heading with TexMex, its configuration, and it's configuration's use of XInclude.Net. You, however, do not get to see that post just now, because I have to complete redo it. Serves me right for not using a different blogging client. Expect to see this message title again soon. I enjoyed this article on print formatting using CSS+XML.